Savoy cabbage growing leaf plant of the species Brassica oleracea in the Capitata Group cultivar of cabbage, Savoy cabbage grow as annual but the flower biennial plant, grow in temperate, mediterranean or subtropical climate and growing in hardiness zone 2-10a spring planting 10a-11 in autumn planting. Leaves edible color is dark green, the leaf grows little stem the shape is ovate the structure of the leaves is wavy with curly like bumps. 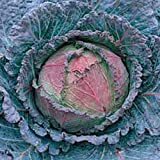 Inner leaves create unique structure of head, Savoy cabbage head composed from inner leaves with hard structure, the outer leaves that soft curly with bumps in wavy structure . Color of the head can be: light green to dark green.